those who can't teach, police grammar on the Internet. 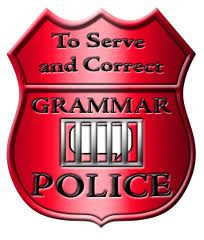 Two psycholinguistics at the University of Michigan have proven the judgmental behavior of grammar policemen reflects a bigger issue: they're annoying people all round. Tests of 83 subjects revealed a correlation between crabbing about typos and grammatical slips and three of the "Big 5" personality traits. People who spot and judge others harshly for sloppy typing and grammar, the study showed, are dogmatic, antagonistic, and introverted. "This is the first study to show that the personality traits of listeners/readers have an effect on the interpretation of language," says lead researcher Julie Boland.